Where Do Loose Ends Come From? I hope you don’t mind, but I’m not done talking about the Los Angeles Times Festival of Books, not yet. I probably could keep talking about it until the 2013 Festival of Books, but I promise not to do that. The books, well, there are so many, and I always come home with stacks of books…all autographed, but the writer panels are the most fascinating part of the festival for me. It’s fun to get a glimpse inside the head of other writers, to see a little of how their brain works, a little of their writing process. Sometimes I feel a connection with a writer—“See, I AM a writer. That successful writer works just the way I do.” Sometimes, I’m intrigued—“Really, that’s the way you work? Hmmmm.” Other times, it’s more like—“Seriously? You do that?” Anyway, the panels are my favorite part. The romance panel, “Love Actually,” was of course at the top of my “must attend” list, but we saw several others as well. The first panel we attended…yes, we. Hunky Hubby attended every one of the panels with me, even though he could have easily gone off to listen to music, look at war books, sports books, car books…there really is something for everyone…did I ever mention that I write in run-on sentences? So anyway, the first panel that WE went to see was titled “Fiction: Loose Ends.” I wasn’t entirely sure what the title meant, but I’m often at loose ends in my writing and decided this was a good place to begin. The panel was an eclectic group of authors, including author/moderator Rachel Resnick and authors Eleanor Henderson, Seth Greenland, Josh Rolnick and Jervey Tervalon. The discussion was quick, witty and intelligent, focusing on the idea that loose ends are what give us a story to tell. Clearly a plot must have loose ends that a character needs to tie together in order to resolve the issues in the story. The loose ends could be a messy divorce, a drug problem, a murder that needs to be solved, a dark family secret that can’t be exposed. Whatever the loose ends, they move the plot, provide conflict and keep the story interesting. But where do loose ends come from? This was probably my favorite part of the panel conversation. Do the loose ends come from your own life experience? Do they come from the experiences of real people that you know? Or do you make them up entirely? For most writers the answer seems to be a mixture of the above. Eleanor Henderson, author of 10,000 Saints, a fictional account of the “straight edge” subculture of the 1980’s, admitted “I’m sort of square, so I write about other people’s loose ends.” I’d have to say that this is somewhat true for me. For the most part, I’ve been a “goody two shoes,” especially when I was growing up. Writing can be a way to experience things that you would never do in your real life, to try on a new personality, test the limits of danger…without ever being in danger. So the truth is, some of what I write may be inspired by what those around me do, some of it comes from curiosity and wishing I had the guts to try things, and some probably does come from my own life. And sometimes, I find myself inspired by my characters to get out there and push my own limits a little bit, try something that I wouldn’t normally try, sometimes, I even try things that might surprise my friends and family…okay, sometimes it’s by accident, but it still counts! When I was a teacher one of the hardest things to teach wasn’t poetry or Shakespeare or grammar. No, the hardest thing to teach was strategies or processes. Why was this so difficult? (Other than the fact teenagers are just difficult on their own). It was difficult because people tend to be Impatient. We live in a world that celebrates the quick fix. A pill to solve everything. A process is rarely something that automatically works. It takes time to develop, to add strategies to. Processes evolve over time. They are not made or implemented in a day. So, when I would teach a process and the students didn’t like it on try one, they wanted to throw it away, to call it useless. So, I made them do it. I required a rough, second, and final draft to be turned in over the course of a paper. Did every student *need* this process? Probably not. When I was in high school, I rarely wrote three drafts. BUT, at one point I had been required to. At one point, I had to learn the process before I decided it wasn’t for me. There’s a lot of writing advice out there, and almost all of it is worthwhile… For someone. That someone might not be you, but one try won’t tell you that. It takes a few tries to really understand a process and really determine if it might help you. And if you’re struggling, in a rut, receiving nothing but form rejections, shaking up your process might be just the thing to help get you over the hump. Just make sure to give something new a real shot, not expect it to be a magical cure. Writing can be magical, but getting there isn’t magic. It’s hard, methodical work. Those willing to work are those that will succeed. Why Aren’t We More Afraid of Social Media? A few weeks ago, I had a wake-up call. Tweets and blog posts I write in the professional realm are subject to scrutiny by those looking for information about my personal life. Of course, I knew this was possible. The Internet is a public forum. But—call me naïve—I thought people had better things to do. So I’ve got to ask…does it bother you that random comments posted on Twitter, Facebook or blogs could give negative people information to use against you? Do you write under a penname to complicate their search or to protect your family and friends? Do you censor your words, hold back? Maybe it’s a generational thing. Having not grown up with the Internet, this necessary invasion of my privacy to benefit my career is creeping me out a bit. 🙂 I’m desperate to know if others feel my paranoia or if I’m alone out here on the edge. How do you balance privacy and publicity while partaking in social media and building a writing career? Which Came First: the Reader or the Writer? I didn’t find the answer at The Los Angeles Times Festival of Books this weekend, but there were throngs of readers, a multitude of writers and stacks of books already written, just waiting to be read. I hadn’t attended the festival in more than ten years, not by choice. Six years we were living in Wyoming, and although I think a twelve-hundred-mile road trip to a book festival in April when the Wyoming weather can be pretty iffy is a good idea, Hunky Hubby…not so sure…scratch that, I’m not so sure either. Anyway, it seems like since we’ve been back in L.A., there has always been a conflict on the weekend of the Festival of Books, and this was the first year that we’ve been able to return. The Festival of Books is one of my favorite events. I mean think about it….it’s a festival…and there are books, lots and lots of BOOKS!!! What more could a book lover want? Well, to meet the authors of course! Many of my favorite writers were there. Judy Blume and Anne Rice each filled an auditorium with devoted fans, but they weren’t alone. Hunky Hubby and I attended the one and only panel of romance writers at the festival, and the first panel of romance writers that the festival has ever hosted. I and the many romance readers that attended were shocked by this fact. After all, we make up the largest group of readers in the market! Finally the books we love were represented by authors that we also love. The romance panel titled “Fiction: Love Actually” included; moderator and romantic suspense writer Dee J. Adams, romantic suspense author Jill Sorenson, and historical authors Tessa Dare and DeAnna Cameron. The discussion was funny and intelligent, and as Hunky Hubby put it, “The best looking panel at The Festival.” The ladies talked about writing their first books, unusual research experiences, their writing processes and shared advice for aspiring authors. These writers have a solid fan base of their own. One of my favorite moments was watching a group of three young women have Tessa Dare sign her latest novel, A Week to Be Wicked, then excitedly ask if they could have a photo with her. They were as excited as any Judy Blume or Anne Rice fans. Tess is their author. I won’t miss The Los Angeles Times Festival of Books again. It’s already on my calendar for next year, so if you plan your wedding or baby shower for the fourth weekend in April, you know I won’t be able to make it. I hope to have my turn to attend as a published author someday soon. Anyone who has ever submitted a manuscript for publication knows that this business is ALL about waiting. You submit. You wait. And wait. And wait. Should your manuscript get an offer then you wait and wait and wait even longer for your manuscript to become a book. People will tell you to keep writing while you wait, and you should. I always do, but that doesn’t mean I have forgotten about the fact that I am waiting to hear back on something else. I have a sub that’s been out for seventeen weeks and counting now. I’m not sure there’s been a day where I didn’t spend at least some time obsessing, holding my breath as I checked email, searching for any signs of when I might hear. I have alternately convinced myself my manuscript has been rejected, accepted, or lost. I have wished away weekends because responses aren’t sent on weekends. In short, this submission has consumed me just a little bit. One thing that has helped the tiniest bit was a piece of “advice” I recently read on a message board. In regards to waits the poster said basically short wait time or long wait time tells you nothing. Having not heard back just means you haven’t heard back. There’s no secret formula to tell you what the outcome is going to be until the outcome… Comes out. I try to repeat this to myself when I’m spending too much time on Twitter or message boards. I’m not done obsessing, but my obsession is WHEN I will hear, not WHAT I will hear. I can’t predict the publisher or agent’s answer, there is no secret formula. What if-ing the outcome to death doesn’t do anything productive. So, I’ll still check my email a zillion times per day, but I won’t be reading into the wait. Ok, I’ll try not to anyway. Writing, reading and sewing are among my favorite pastimes. None of them burn any calories…and if I throw cooking in there, I’m in big trouble, because then I’m sitting on my, um, behind, absentmindedly eating naughty food while I read or write…I don’t eat while I sew. No food or drinks allowed near my sewing machines or projects. That’s a rule, except for the one time when Hunky Hubby set up a play date for me and a quilter he worked with (Hi, Debbie), and then proceeded to make blender after blender of strawberry margaritas while we, ahem, worked. But, that’s another story, and it didn’t end well. Anyway, this has nothing to do with writing, well, actually it does, because what I planned to talk about was the book I just read by Susan Wiggs, The Goodbye Quilt. I picked up the book because I love to sew, I love to read, and of course I love to write, and here it was, a book that combined two of those things…really all three, because it offered writing inspiration. I’d never read a book quite like this, but a number of people have told me that I really should write a book that combines my love of sewing or cooking with my writing. The heroine in my current WIP is a fashion designer, and although I use some of my sewing knowledge and love of fabrics and fashion in the story, it’s not an integral part of the story. She could be a chef or an architect, or any number of other things and the story would hold together. In The Goodbye Quilt, however, Susan Wiggs has skillfully embroidered a beautiful story that both literally and figuratively stitches together the different fabrics and embellishments that make up a life. There isn’t a lot of drama, and the conflict is more about the inner turmoil that a mother goes through as her child becomes a young adult and she has to let go. It’s everything it should be. As a mother of three young adult sons, I could feel every word on the page. I was Linda, the mother in this story, as she chose a remnant from a party dress or a small button to add to the intricate quilt she was making. I’m right there with her, torn between wanting my boys to experience life and fulfill their dreams and wanting to pull them back under my wings where I can protect them. But really, I was fascinated with the way she wove the making of a quilt, something so creative and unique, into her story. I’m already making notes about how I might do this as well. Okay, I’ve read a book this week, and I’ll be working at the sewing store (and possibly sewing this evening)…I really need to do something to get up off my, um, behind, and burn some calories. I think I’m alone in the house….I’m going to go use that Wii Hunky Hubby got me for Christmas and Zumba. Don’t tell the kids, but it just might be my Wii! So what do you think? Do you have hobbies or interests that could be more than the details of your story? That could actually drive the story and move it forward? I’d love to hear about them. Where I write: I write from the Arkansas Ozarks. 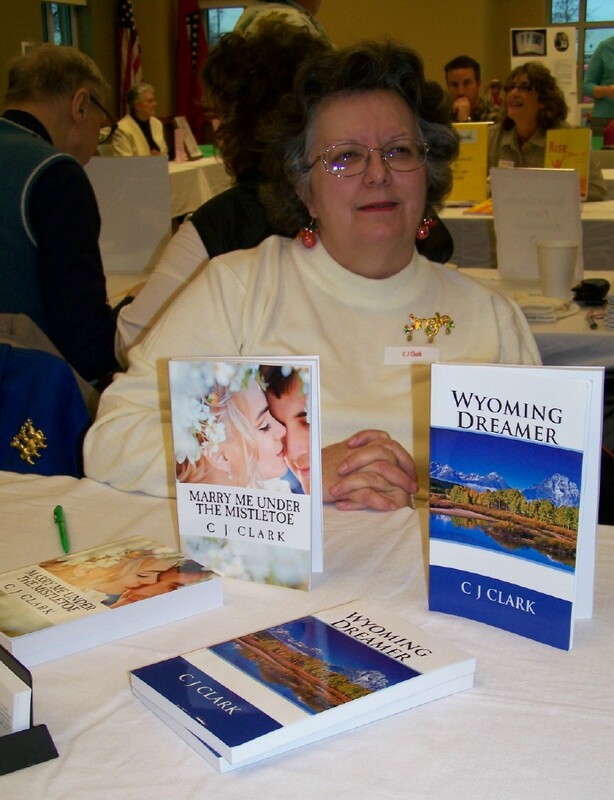 What I write: I write contemporary romance stories and have two books available from CreateSpace.com, Amazon.com and both are on Kindle and Nook. Wyoming Dreamer is the story of an abused woman who’s gone through a divorce and decides to follow her dream of living out West. Although she doesn’t want a man in her life, when she meets rancher Quaid Kincaid, she changes her mind. Since both have baggage, they must come to terms with their pasts and their future together. Marry Me Under the Mistletoe is a humorous romp about an overweight gal who tweaks her personal info to an online guy. When he invites her to Colorado, she has to either lose weight fast or fess up to her lies. Imagine the surprise when she discovers he’s played the same game. Can they confess and let bygones be bygones? And what about that luscious workout instructor making eyes at her man? Or that Scot that’s coming on to her? Who wins whom? Best rejection: The first chapter of Marry Me Under the Mistletoe (formerly titled Christmas in Colorado) finaled in the 2010 Weta Nichols Award Contest of Ozark Romance Writers. What keeps me writing: Knowing that practice makes perfect. Someday. . . someday. . . I want to be famous. I am a writer because: It is my forte. I’ve always loved and excelled in English Composition classes. Because it allows me to be people (characters) I am not, which is a lot of fun. Because writing is soothing for me (except when on a deadline). It’s a basic question, one that many writers face from time to time. Whether it’s from well-meaning family and friends or from interviews, like the ones we publish for Writer Wednesday, writers should expect to explain why they write. For me, the simple answer is that I write because I enjoy it. The more creative answer is that I write because the voices in my head need a reason—other than insanity—to be there. But those aren’t the only reasons. The reasons are many, and some are complicated, making this a topic I often ignore. After all, why should I care about why I write as long as I’m writing? Honestly? Sometimes, I don’t enjoy writing, and sometimes the voices in my head quiet. That’s when I stop writing. That’s when I wonder why I was writing at all. That’s when I need a reminder of the many reasons why I write. I write because I like the distraction from my daily life. I write because it gives me control over somebody and some things. I write because finishing a story proves I’m capable of following through to the end. I write because creating fictional characters, nurturing them and giving them whole lives satisfies my maternal instinct. I write because it occupies my time. I write because the tapping on the keys fills the quiet room. I write because I want to be read. It’s not an all-inclusive list. I’m sure I’ll think of more. Can you add to the list? I’ve spent the last two weeks trying to get back in touch with my characters after a long break from my writing. Last week, I read. This week, I went to Hermosa Beach, where the story is set, to walk, write, and try to find my main character again. I know she’s there. The interesting thing is, that I’ve felt my hero more than my heroine, so I’ve been focusing on him, the gorgeous hunk who sweeps her off her feet, although he seems to be swept off his feet as well. The story actually starts in the hero’s point of view, then moves to the heroine’s point of view later. I like it, but I’ve had comments both ways. Most of my “volunteer” readers and critique readers have said they wouldn’t change it, but a couple have told me they want the story to start with the heroine’s point of view first so they feel like they know her when the hero and heroine meet…which happens in the first few lines of the book. I’ve written an alternate opening, starting with HER point of view, but I like the original better. So should a story start with the heroine’s point of view, or can it work when it starts with the hero’s point of view? Is it okay to see the heroine through HIS eyes first? Tell me what you think? I’d love to know. Sooooo…I am the worst blogger ever. I almost forgot to blog again today. And when I remembered, for a brief second, I thought about blowing it off. But then I thought about Tari, who manages to blog near faithfully despite all the craziness in her life, and I couldn’t walk away from this laptop without writing something. Since my brain is fried, I’m simply going to tell you where I’ve been and what I’ve been up to–in case you wondered. I’ve been neck-deep in this motherhood thing. How is it possible they are needier now than when they were babies? With two teens and a 10-year-old, you’d think things would run smoothly around here, and you’d think the quiet hours when they are all at school would afford me ample time to indulge my whims. But no. Even when they aren’t here, they control me. By the time I run the errands, wash the wash, and plan a way to feed three kids going in three different directions, I’m exhausted…and ornery…and pretty sure every other mother is better at this than me. Worse yet, when I get like this, I do stupid things. It’s a type of rebellion, I’m sure. I need a distraction in a big way. When I was younger, I got pregnant, or I got a dog or cat. Now that I’m older, I’m slightly more mature about it, realizing adding responsibility isn’t going to solve anything. Instead, I take off on a girls-only vacation, or in this case, I decide to buy a house. *face palm* The good Lord needs to show me some other ways to rebel. So there you have it. This crazy thing called life has grabbed me between its teeth and is shaking me back and forth like the squeaky chew toy that I am.